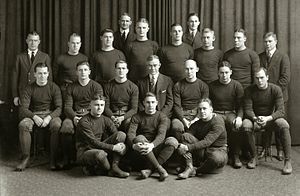 The 1920 Michigan Wolverines football team represented the University of Michigan in the 1920 college football season. The team's head coach was Fielding H. Yost. The Wolverines played their home games at Ferry Field. The following 16 players received their "M" letter for their play on the 1920 football team. Derrill Pratt was a Major League Baseball player. ^ "Michigan Beats Tulane, 21 to 0". Detroit Free Press. October 31, 1920. p. Sports 1. ^ Viggo O. Nelson, born January 16, 1895, Racine, Wisconsin. He was the son of Danish parents. In 1930, he was the secretary at the YMCA in Ann Arbor. Died February 1971, Ann Arbor, Michigan. ^ John Stephenson Perrin, born February 4, 1898, Escanaba, Michigan. Died June 1969, Detroit, Michigan. ^ Hugh Edward Wilson, born June 14, 1899. In 1930, he was a lawyer living in Ionia, Michigan. ^ Charles C. Petro, born September 25, 1900, Ohio. Died August 10, 1986, Westlake, Ohio. ^ "Camp Names Gridiron Stars". Post-Standard (Syracuse). 1920-12-15. ^ "Perry Selects the Best Foot Ball Players". Lebanon Daily News. 1920-12-02.